The Los Angeles Dodgers’ Ross Stripling tossed 7⅓ innings of no-hit ball in his first major-league appearance Friday night before being pulled for a reliever who lost the no-no. When Stripling hit 100 pitches, Dodgers’ manager Dave Roberts took the ball and handed it to Chris Hatcher, who yielded a two-run homer to Trevor Brown to kill the chance of a combined no-hitter and even the score at 2-2. The Giants wound up winning the game in the bottom of the 10th on a walk-off homer by Brandon Crawford. 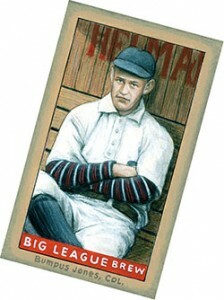 The only pitcher to throw a no-hitter in his first major league appearance is the Cincinnati Reds’ Charles “Bumpus” Jones. Jones got the start for Cincinnati’s final game of the 1892 season on Saturday, October 15, and no-hit the Pittsburgh Pirates for a 7-1 home victory at League Park. Two pitchers (Ted Breitenstein and Bobo Holloman) have thrown no-hitters in the first major league starts, but only Jones did it in his first major league appearance. You can read about Jones, Breitenstein and Holloman in Chapter 4 of Baseball’s No-Hit Wonders: More Than a Century of Pitching’s Greatest Feats. @nonohitters Has anyone other than Jones kept opp. hitless for first 27 outs of career?